In a country so far north that half of it is above the Arctic circle, the fall and winter nights are long and dark, leaving ghost stories and spooky legends to become a big part of the local history and folklore in Norway. Here, even the beautiful northern lights have always been the object of intrigue and fascination. Some thought it them dangerous and alerted danger, while others thought it was the souls of dead virgins floating across the night sky. In Norse Mythology it’s called the Bifrost Bridge, or the rainbow bridge to Asgard. Winter is a mysterious yet magical time in this part of the world. According to folklore and legends, the Norwegian mountains and forests are riddled by trolls and other mysterious creatures. These aren’t necessarily mean, but they do look rather scary and have frightened people for centuries. The idea of trolls comes from old Norse Mythology and is inspired by jotuner – the main enemies of the Gods. These creatures were giants, and in the central parts of southern Norway where the biggest mountains of Northern Europe are located, lies the national park of Jotunheimen -the name meaning ‘home of the giants’. If you want to see more of this area or pick up some information about trolls, check out the cool Norwegian mockumentary The Troll Hunter (2010). This old royal fortress from the middle ages lies in Oslo and supposedly is one of the places in Norway with the highest level of ghost activity. A lot of people were imprisoned and executed here. The staff says they’ve heard whisperings in the dark corridors and have had strange forces pushing them in the back. People also tell of screams and sounds of rattling of chains in the night. Some have even seen guards standing on post – but disappearing into thin air a second later. Would you dare walk around the fort in the middle of the dark night? I sure wouldn’t. Click here to learn more. This old hotel in Telemark is probably one of the most well known haunted hotels in Norway. They call themselves the ‘Fairytale Hotel’ but this story is anything but. In the 1800’s, a young English lady named miss Greenfield came here all alone. No one knew she was pregnant… When the maid came to clean the room after her, the door was locked and on the bed, she found a dead infant. Miss Greenfield was arrested and executed, and to this day “The English Lady” is said to walk the corridors of the hotel, and the sounds of a crying baby is said to be heard from Room 17. Every night to this day, the hotel sets a table for Miss Greenfield and lights a candle for her. It’s said that the flame is never still, but always flickering. Norway has a long and beautiful coastline, but also lots of legends connected to it. Draugen is a water creature – the ghost of a man who once died out at sea. He looks like a huge monster, covered in seaweed and can sometimes be seen rowing in half a boat. If you venture out to sea on a dark and stormy night you might just meet him, hearing his terrible screams before he knocks your boat over – sending you to the bottom of the ocean. Yes, he is definitely the type of scary creature you do not want to meet. This old mental hospital outside of Drammen closed its doors in the 80’s. Its history is as dark and creepy as the old building looks today. Torture and experimental drugs lead to lobotomies and human testing with drugs like LSD. Many patients suffered greatly there, and it’s said that a dark energy lies over the place. In the later years, it has become a hot spot for young ghost hunters, but the area is now closed off because the building is becoming quite unstable. This one is definitely at your own risk. 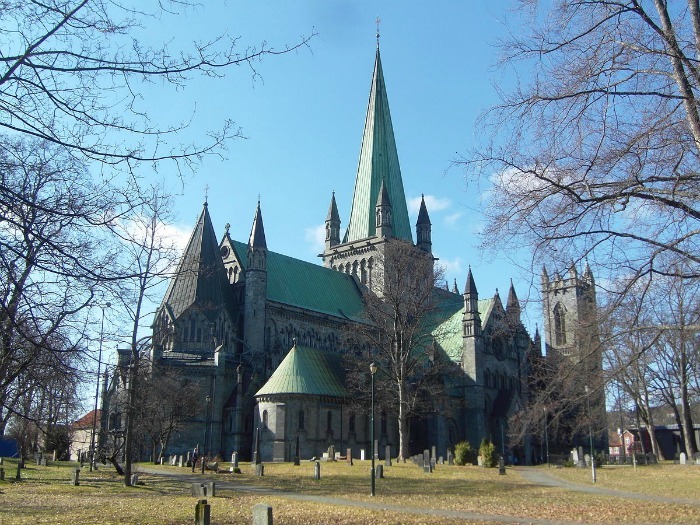 In the beautiful 1,000-year-old cathedral of Nidarosdomen in Trondheim, you might just meet the most famous ghost in Norway – the monk. He is a tall figure, with glowing eyes and blood pouring out of a cut in his throat. Sometimes he is seen with his whole head falling off! He was first seen in 1924 by the bishop’s wife, in the middle of a service. In other words, he might just pop up anytime –right in front of you! At the church ruins of Nes, there have been so many strange encounters that the place has actually had a sign saying that there’s spiritual activity there. The stories say a priest hung himself in the church, a wedding couple drowned in the river next to it, and that a big storm laid the church in ruins – like it’s still seen today. Reports say that flashlights stops working there, and unknown forces push you to the ground. Some say their movements slow down, like if they were walking through water. People driving to this place have also had the electronics in their car acting up. Imagine driving there one evening, and having your car break down! I think I’d use a bike for this one. At this stunning and unique wooden hotel in Møre and Romsdal, you probably won’t be alone when you go to bed if you’re staying in the Blue Room. It’s said that a maid named Linda drowned herself in the fjord after her loved one committed suicide when his wife refused to grant him a divorce. There are numerous accounts of visitors to the Blue Room having seen her, heard her footsteps and her sobs as she cried in the night. Still, this doesn’t seem to put visitors off as the room is the most popular in the whole hotel, and reservations need to be made several months in advance. Sir Arthur Conan Doyle, who wrote about Sherlock Holmes, even stayed here back in 1891. Want to visit, click here. If you’re in Oslo around Halloween and would like to go on a two-hour ghost hunt, join Oslo Walks for one of theirs through the old center of town. Oslo is a very old city, and there are definitely many creepy things that have happened there, starting with bloody Viking battles a thousand years ago. By joining a tour you won’t have to go alone! It’s always nice to have a hand to grab onto when you start to feel chills coming down your spine. For more information on this click here. If you aren’t into tours but want to explore Oslo on your own you can always use a bike to get around. There are loads of places to explore beyond the mysterious ones in this article. For more information and other spooky places, take a look at this article from visit Norway.